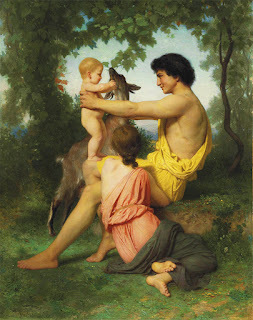 As anyone familiar with the myths knows, before Paris become a prince of Troy, he was a shepherd boy on Mount Ida, and while living upon Mount Ida, caring for his father's flock and earning the name Alexandros for his bravery in defending the livestock against raiders, he carried on a relationship with a nymph by the name of Oenone and had a child, a son by her, named Corythus. Perhaps Oenone was even his wife. In the retelling of Paris's story, and his single-minded abduction of Helen, Oenone is often forgotten. Perhaps that's fitting, since Paris appears to forget her completely the moment that the lure of Helen is set before him -- perhaps it's only natural that we, also, would then be inclined to overlook her, in our zeal to get to the Action of the story and the Trojan War itself. But poor Oenone -- poor Oenone does not forget. She doesn't forget the love she had for Paris, their days spent hunting and herding and traipsing up and down the mountain together. She doesn't have the luxury of forgetting after she's left behind on Mount Ida, the proof of their relationship in the child she holds in her arms. "...I was the first to spy and know the sails of your bark, and my heart’s impulse was to rush through the waves to you. While I delayed, on the highest of the prow I saw the gleam of purple – fear seized upon me; that was not the manner of your garb. The craft comes nearer, borne on a freshening breeze, and touches the shore; with trembling heart I have caught the sight of a woman’s face. And this was not enough – why was I mad enough to stay and see? – in your embrace that shameless woman clung! Then indeed did I rend my bosom and beat my breast, and with the hard nail furrowed my streaming cheeks, and filled holy Ida with wailing cries of lamentation; yonder to the rocks I love I bore my tears. So may Helen’s grief be, and so her lamentation, when she is deserted by her love; and what she was first to bring on me may she herself endure!" Poor Oenone was not a woman who was content to be set aside. Nor do I imagine does a nymph often find herself in the position of spurned lover. And I can only imagine what their life must have been before -- before Helen, before the goddesses and the cursed apple, before Zeus decided that he would have his war to end the age of heroes and cleanse them from the earth. Certainly it must have been happy, for her to be so heartbroken at its lose. Oenone loved Paris, unquestionably. And it seems, too, that she believed Paris loved her back. It's a shame it couldn't last.